We have 3 Attractions this year with plenty of scares for everyone: Haunted Forest featuring "Mike Meyers coming home" and the Five Nights at Freddys; Zombie Lazer Tag Maze and a Haunted Hayride led by our famous Beetlejuice. Hayride and Roasting Marshmallows are included with either attraction. 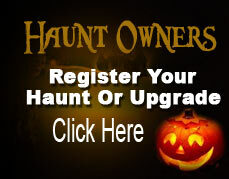 Open every Friday & Saturday in October and Halloween Night.